Jonah 3:10; 4:1-2(KJV); And God saw their works, that they turned from their evil way; and God repented of the evil, that he had said that he would do unto them; and he did it not. But it displeased Jonah exceedingly, and he was very angry. And he prayed unto the Lord, and said, I pray thee, O Lord, was not this my saying, when I was yet in my country? Therefore I fled before unto Tarshish: for I knew that thou art a gracious God, and merciful, slow to anger, and of great kindness, and repentest thee of the evil. God’s plan of compassion, forgiveness and deliverance outshines any need for a man to see his prophetic utterances come to pass. Jonah did not understand this at all. His mind was set on the destruction and fall of Nineveh as he had prophesied it that he overlooked God’s desire to save them at any cost. In our present day, this mind set is still existent. Some ministers are more concerned about their prophecies coming to pass simply to prove that they are men and women of God. It is inconsequential if you prophesy disaster and it doesn’t come to pass because you took the initiative to pray against what you saw; it does not make you less of a man or woman of God. If anything, it is a mark of maturity. If the Lord shows you something negative that is about to happen, get on your knees and pray about it or invite the congregation to join you in praying about it. Don’t broadcast it then rub your hands with glee, waiting for the day it will come to pass so you can pounce around as a great minister of the gospel. God reveals to redeem. He has a program of forgiveness. Let this mind be in you child of God. In all things, we look to the grand scheme of God’s plan and desire to save. It is about Him, not us. PRAYER: Father God, I thank you for this great wisdom. I understand the loving kindness by which you draw many and I emulate it in all things. I understand the responsibility that comes with the things you reveal; the responsibility of prayer and intercession and of standing in the gap. I am faithful in this understanding and never seek my glory but yours. In Jesus’ name. Amen. Jonah 1:1-3(KJV); Now the word of the Lord came unto Jonah the son of Amittai, saying, Arise, go to Nineveh, that great city, and cry against it; for their wickedness is come up before me. But Jonah rose up to flee unto Tarshish from the presence of the Lord, and went down to Joppa; and he found a ship going to Tarshish: so he paid the fare thereof, and went down into it, to go with them unto Tarshish from the presence of the Lord. 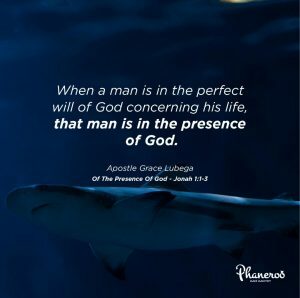 When a man is in the perfect will of God concerning his life, that man is in the presence of God. Our theme scripture reveals that when Jonah chose to run away to Tarshish and not go to Nineveh where the Lord had sent him, he consequently went away from the presence of God. When you go in the opposite direction of where He has sent you, to a certain degree, you leave His presence. Do you just wake up in the morning and go where you want to go? Are your footsteps ordered by the Lord? When you are at work at the job God ordained for you, His presence is with you; you are not alone. In that business, if the Lord has placed you there, His presence is with you because He sustains what He calls. As a child of God, learn to respond to His instructions on where to go and where not to go because that determines the degree of His presence available to you. PRAYER: Father, I thank you for your Word. This day, I choose to respond to your instruction on where I should go. You order my footsteps and I follow your leading with the full guarantee that your presence goes with me. I live a life perfectly aligned to the will of God; conscious of the fact that you are with me, in me and for me. In Jesus’ name. Amen. God has not only made known to us His will; He has made known unto us the MYSTERY of His will. Making known unto us the mystery of His will means that He has also given us the mind of why He wills like He does. It is one thing to know what God desires; it is a deeper place to understand why He desires it; this is a greater place of intimacy with the designs of divine purpose. The mystery of His will is not a present continuous experience as you relate with God; it is a past tense experience. It is not in the realm of progressive knowledge but of advanced knowledge. God let you in on His grand scheme and plan; it is the very reason why you live your life from the very end; it is why the future cannot be a mystery to you. For some, the future is a question, to you, the future is a revealed life. God has not only made known to us His will; He has made known unto us the MYSTERY of His will. 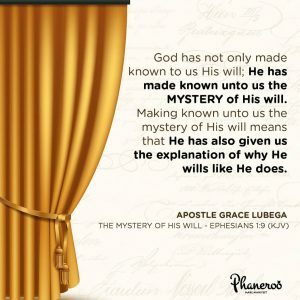 Making known unto us the mystery of His will means that He has also given us the explanation of why He wills like He does. PRAYER: Father God, I thank you. What a blessed truth to know that you have revealed unto me the secrets of your heart and your deepest convictions. I have the advanced knowledge of God and live past the illusion of time, beholding the past, present and future like you do. I live with the boldness of one who has been to the end of this life and is alive to build my existence around the pattern that I beheld. I run my course with accuracy because of the vision of the end that I continually behold, which end can only be you. In Jesus’ name. Amen. Daniel 12:3(KJV); And they that be wise shall shine as the brightness of the firmament; and they that turn many to righteousness as the stars for ever and ever. Wisdom causes you to stand out and to be set apart amidst so many. Like our theme scripture reveals, it causes you to shine as the brightness of the firmament. 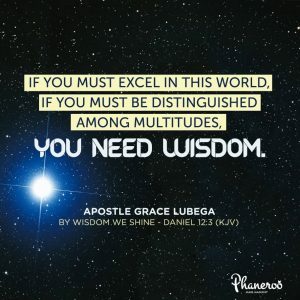 If you must excel in this world, if you must be distinguished among multitudes, you need wisdom. Even Christ, the son of the living God needed it. If Christ needed to grow and increase in wisdom, you too need to. The scriptures say of wisdom and knowledge that they are stability of our times and the strength of our salvation (Isaiah 33:6). Wisdom gives you stability; it is what makes you a strong Christian. You need wisdom to shine; you need wisdom to stand. You are as strong as you are wise; you are as bright as you are wise. The blessed news is that Christ has been made our wisdom. When you receive Him, you received all the treasures of knowledge and wisdom. Live, speak and act with the consciousness of one who is crowned and mantled with wisdom. Glory to God! PRAYER: Loving father, I thank you for the crown of wisdom; it is wisdom that you have called me and it is in wisdom that you have planted and established it. I pattern my life after its dictates, I follow its voice and respond to its call; be it on the physical streets I tread or the celestial streets of heaven. By wisdom I build, by wisdom I minister and by wisdom I grow. In Jesus’ name. Amen. 1 Corinthians 12:31(KJV); But covet earnestly the best gifts: and yet shew I unto you a more excellent way. Success is very predictable, when a man, by the scriptures, understands how it comes. God wants you to understand success the Word-way and not the world’s way. Our theme scripture reveals to us the most excellent way of success-it is the way of love. Often times, people struggle in life because they have not understood the love walk; they fail in business and in ministry because they walked outside love; they start initiatives which collapse because their ideals are not founded on the greatest ideal of all, which is love. This is not merely one loving God so much to start a ministry, a foundation or pursue a cause; this is one responding to God’s boundless love for them and it is in the understanding of His love that they start ministry or pursue any cause. For every child of God, success comes in the revelation of the love of God toward the Christian God has blessed and the purpose of why God has blessed him or her. If success comes without the revelation of the love of God, that sort of success shall be short lived. Success without the revelation of the love of God is success outside divine purpose and the perfect will of God for one’s life. Divine purpose is only established in the revelation of agape; agape is revealed every time people walk in purpose. Child of God, lasting success stands on the immovable foundation of understanding God’s love toward you in all things that you seek to pursue. It is this revelation of love that will cause you to stand when you feel like quitting; it is this revelation of love that will cause you to endure when the tides appear to have turned against you; it is this revelation of love that will cause you to believe in what you have started when those around you have lost faith in you. Love never fails. When you embrace it, neither can you fail. 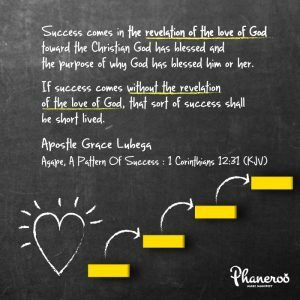 Success comes in the revelation of the love of God toward the Christian God has blessed and the purpose of why God has blessed him or her. If success comes without the revelation of the love of God, that sort of success shall be short lived. PRAYER: My loving father, I thank you for this day, for your great Word and gracious knowledge. I am a love child, perfected in the understanding of its height, breadth, length and depth. All that I do is a response to your great love for me. Because love never fails, I will never fail. In Jesus’ name. Amen. Romans 7:18-20(KJV); For I know that in me (that is, in my flesh,) dwelleth no good thing: for to will is present with me; but how to perform that which is good I find not. For the good that I would I do not: but the evil which I would not, that I do. Now if I do that I would not, it is no more I that do it, but sin that dwelleth in me. There is a continuous war between the man of the flesh and the man of the spirit; the inner man and the physical man. The physical man has a way in which he views the world which is wholly different from how the man of the spirit sees the world. 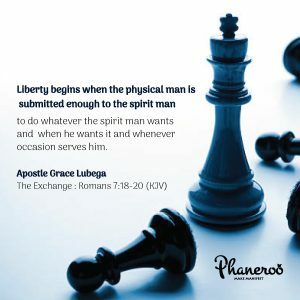 Liberty begins when the physical man is submitted enough to the spirit man to do whatever the spirit man wants and when he wants it and whenever occasion serves him. True warfare is when we learn to build the inner man, that at all times and in all places, he brings the physical man into subjection to him. This battle is won every time we live from the inside out rather than from the outside in. Be strengthened in the inner man through His Holy Spirit because every time you are fortified from within, you win from without. Glory to God! PRAYER: Father, I thank you for the victory that I have in you. How can I fail when you have made me your permanent habitation? I rest in the blessed assurance that you strengthen me every day; you uplift my spirit from the deepest dumps and cause me to soar in the planes of victory. In all that I do, I look within and never without, for there is the testimony of strength and of truth. In Jesus’ name. Amen. 1 Corinthians 2:16(KJV); For who hath known the mind of the Lord, that he may instruct him? But we have the mind of Christ. You can never understand His mind by studying it as one who is separate from Him. In fact, you will never know God by separating yourself from Him. You can only know God’s mind by understanding your oneness with Him in the Spirit. Without the revelation of oneness, you cannot understand truth and perfection or even the person of God. He is in you; you are in Him; His thoughts are your thoughts; His plans are your plans; His convictions are your convictions. The access into the manifestation of this truth is faith. This means that you ought to believe that you have God’s mind pertaining everything. By faith you have access to the mind of God. Grow in this consciousness child of God; Purpose to live life with the understanding that you and Him are one and that the deepest convictions of His heart are the very convictions of your heart. His name be praised! 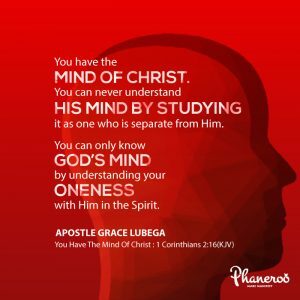 You have the mind of Christ. You can never understand His mind by studying it as one who is separate from Him. You can only know God’s mind by understanding your oneness with Him in the Spirit. PRAYER: Father, I thank you for your Word. I rest in the knowledge that I am in you and you are in me. I walk in the blessed assurance of oneness with the Father. My life is patterned after your thoughts, convictions and desires. Because I have your mind, I know how and when the winds of divine purpose blow. At all times and in all places, I am positioned to execute divine purpose, to the glory of your name. Amen. Romans 5:8(KJV); But God commendeth his love toward us, in that, while we were yet sinners, Christ died for us. It is deception to assume that your value in the eyes of God reduces when you have done something bad or increases when you do something good. That kind of thinking dishonors the blood of Christ and the price He paid at Calvary. Not even your worst sin in scripture has changed your value before God. In spite of what you have done, you are still His precious and priceless child. Your good works are not a qualification. In fact, you can never be good enough to earn God’s grace. 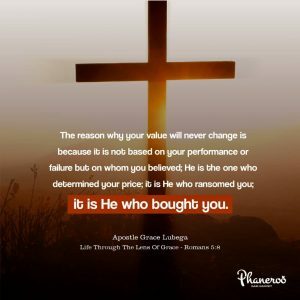 The reason why your value will never change is because it is not based on your performance or failure but on whom you believed; He is the one who determined your price; it is He who ransomed you; it is He who bought you. Purpose to live life through the lens of grace; God knows you have made mistakes, but never think you are a mistake. Never allow yourself to be overcome by your blunders, always look to Christ in the knowledge that you are precious in the eyes of the father. Yes, you might have messed up but pick, dust yourself up and move on, be better, walk out of sin, God wants you out and so do you. You are born of incorruption and purity is a divine beauty and a portion of your new nature in Christ. PRAYER: My God, I thank you for who I am to you and in you. You have blessed and preserved me exceedingly. You watch over and protect me because I am precious in your sight. You are the lifter of my head, the strength of my heart and the health of my countenance. I choose to live my life through your eyes; to see myself in the same way that you see me; in all things and through all things. In Jesus’ name. Amen. 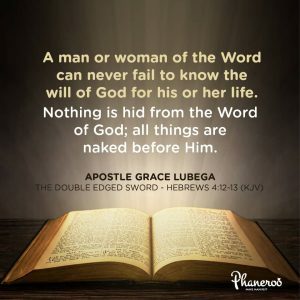 Hebrews 4:12-13(AMP); For the Word that God speaks is alive and full of power [making it active, operative, energizing, and effective]; it is sharper than any two-edged sword, penetrating to the dividing line of the breath of life (soul) and [the immortal] spirit, and of joints and marrow [of the deepest parts of our nature], exposing and sifting and analyzing and judging the very thoughts and purposes of the heart. And not a creature exists that is concealed from His sight, but all things are open and exposed, naked and defenseless to the eyes of Him with Whom we have to do. 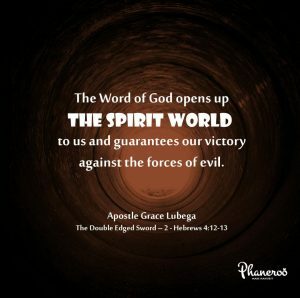 The Word of God opens up the spirit world to us and guarantees our victory against the forces of evil. Our theme scripture reveals that because of the Word, all things are exposed, naked and defenseless to us. It is one thing for things to be open to you but it is quite another for them to be defenseless before you. When something is open before you, you can behold its nature but not have the grace to change its from. When something is defenseless, it means that you have the grace to not only behold its nature but also to change its form. You can heal the sick because sickness is naked and defenseless before you. You can cast out demons because they are naked and defenseless before you. You can avert the plans of the enemy because they are naked and defenseless before you. PRAYER: My Lord, I am most grateful for the Word for this day. Today, my vision is deepened to see in the realm of the spirit. Because of the Word in my spirit, I am not ignorant of the enemy’s devices. All his schemes are naked and defenseless before me. This is the testimony of my victory. In Jesus’ name. Amen.